Cerakote is the world’s toughest coating, or finish that can be used to customize the appearance of your firearm. Not only does Cerakote add a customized look to your firearm, it also enhances abrasion/wear resistance, corrosion resistance, chemical resistance, impact strength, and hardness of the firearm. The coating can withstand up to 1600 degrees Fahrenheit, and will withstand virtually any cleaning product, even those that are acid based. 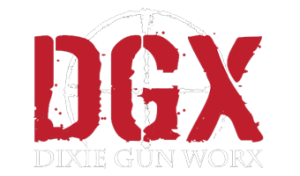 Want the protection of Cerakote without adding color to your firearm? Cerakote also comes in a clear finish, giving you the protection and resistance of Cerakote, without changing your firearm appearance. Another product offered by Cerakote ceramic coatings which we use at DGX is called Micro Slick. This is a dry film coating that enhances internal components such as bolts and bolt carriers. Micro Slick film reduces friction to these internal parts, boosting your performance and adding to the overall lifespan of the firearm. 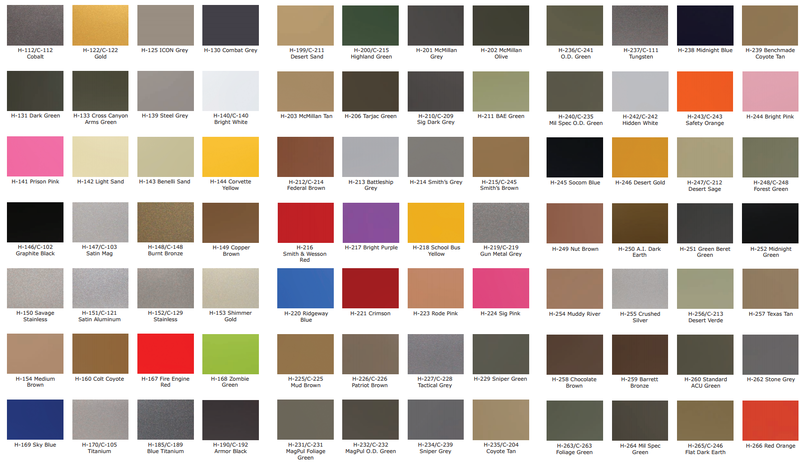 Shown below are the color options that we use at DGX. Take a look at some of our work with Cerakote in our photo gallery, then come see us to help customize your firearm with Cerakote.